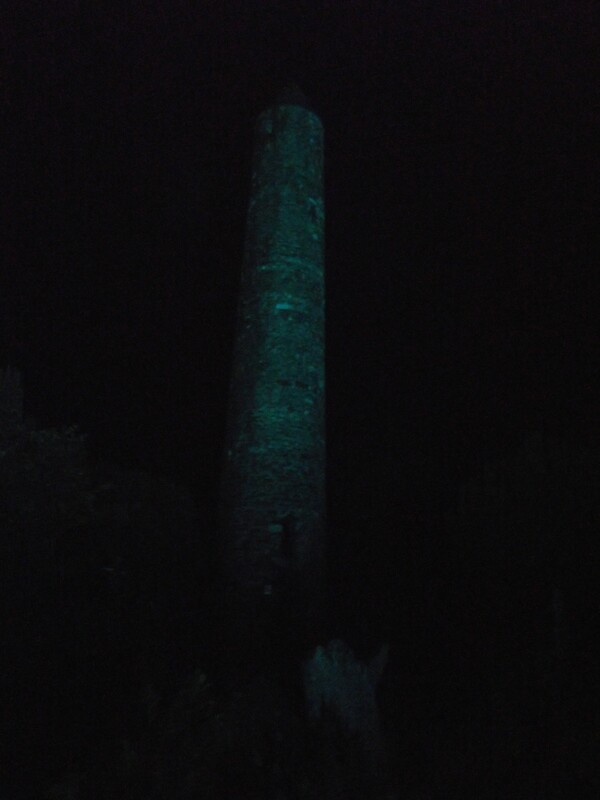 The inaugural Glendalough Arts Network Lantern Walk event took place last Friday night, 22 October, 2010. On the run up to the walk children from Scoil Chaoimhin Naofa had taken part in ‘make your own lantern’ workshops and prepared their “Story for the Future”. Despite the atrocious weather, the vote from the group who were present for the formal opening ceremony in Lynhams Hotel was to ‘go for it’. Michael Holden, one of the elders of the village, lit the first lantern which was designed by Stephen Moss from the Blue Glass Studios, and Martin Swords read out a poem, “Lights in the Valley”, he had written especially for the event. Over 200 people from the community joined the walk, and the procession snaked its way through the Glendalough Woolen Mills and along the Green Road in an enchanted atmosphere of community spirit and wonderment. There were dramatic and musicical surprises en route, the first being St. Kevin and the Blackbird, then on to the Leprechaun tale and the spirits of the woods. Local miners also had a part to play and told the group about the history of the Glendalough Mines and how the miners in Chile were rescued with the help of equipment designed in Ireland. There was a minute silence to honour past miners and to celebrate the saving of the miners’ lives in Chile. The local choir sang a few songs while the Round Tower was lit in the background with all colours of the rainbow. Alan O’Baille, our local piper, then led the group to the Glendalough Hotel where they were joined by more members of the community and a welcome cup of hot tea. The local Comhaltas group played some music and there was an exhibition of set dancing and the local choir sang “An Irish Blessing”. Some of the children then read quotes from their Story for the Future. Before the event was closed the community were asked if they wanted the event to be held next year and the answer was a resounding ‘Yes!’. The children then had a chance to ‘boogie on down’ and there were local musicians in the lounge until late for the adults. It was a wonderful evening enjoyed by all and with the support of the community this event has given birth to the “Lights in the Valley” Festival which will take place again next year. The next day saw an exhibition by 23 local artists and craftspeople in the Glendalough Hotel. Visitors got a chance observe demonstrations of crafts and paining and some even took part. Many thanks to all the members of the Glendalough Arts Network, particularly John Lawlor (Director of the lantern walk event), all the volunteers and stewards on the night, Scoil Chaoimhin Naofa, Sgt Mary Burbage and Gda Richie Halpin, Order of Malta, Glen of Imaal Mountain Rescue, Glendalough Hotel and Lynhams Hotel. Thanks also to the people who baked food and cakes, the actors, musicians, singers and dancers who performed on the night and everybody who helped out in any way and the community who participated on the night. Also special thanks to Wicklow Mountains National Park and Office of Public Works/Monuments for all their support. The names of the artists, actors, musicians and all who contributed will be available on the website over the coming days. You can find a full gallery of photos for the Lantern Walk here and the Arts and Crafts Exhibition here.